This is an odd one – a mobile phone that’s designed to sit on a desk and operate as a speakerphone, rather than actually go anywhere. 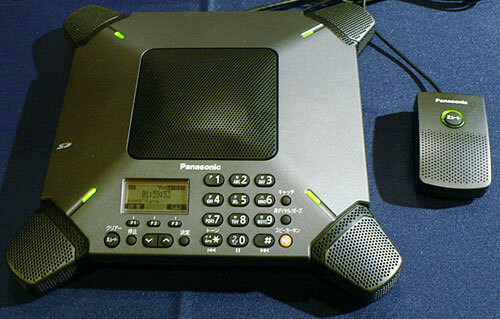 The beast in question is called the Conference Speakerphone and is the result of a collaboration between Panasonic and Willcom, Japan’s last remaining operator to use the old PHS standard. The ¥100,000 phone has a SIM card, a speaker and microphone on each of its four corners and an SD card slot for recording conversations digitally. The only thing preventing users picking up the jumbo mobile and going walkabout is that it has no battery and needs to be plugged into the mains. It might seem strange for Willcom to sell a speakerphone that can’t hook up to regular telephone lines, but the appeal is in the network’s flat-rate talk plans that allow companies to equip all their staff with PHS handsets that can communicate with each other for free. Makes a bit more sense now?